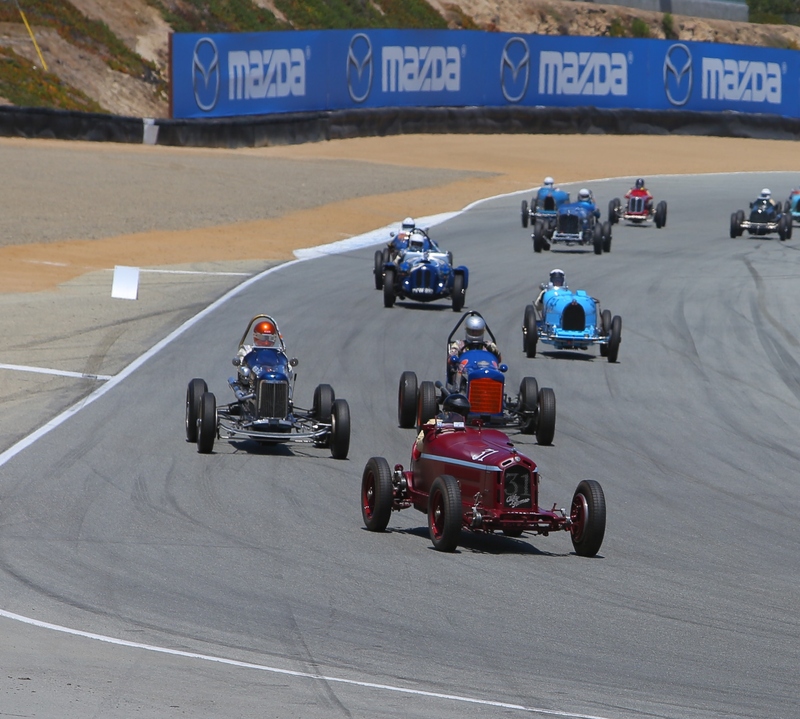 MONTEREY, Calif., Aug. 1, 2016 —When the green flag waves Aug. 18 to kick-off the seventh edition of the Rolex Monterey Motorsports Reunion at Mazda Raceway Laguna Seca, spectators will enjoy a paddock filled with 550 authentic race cars steeped in history. 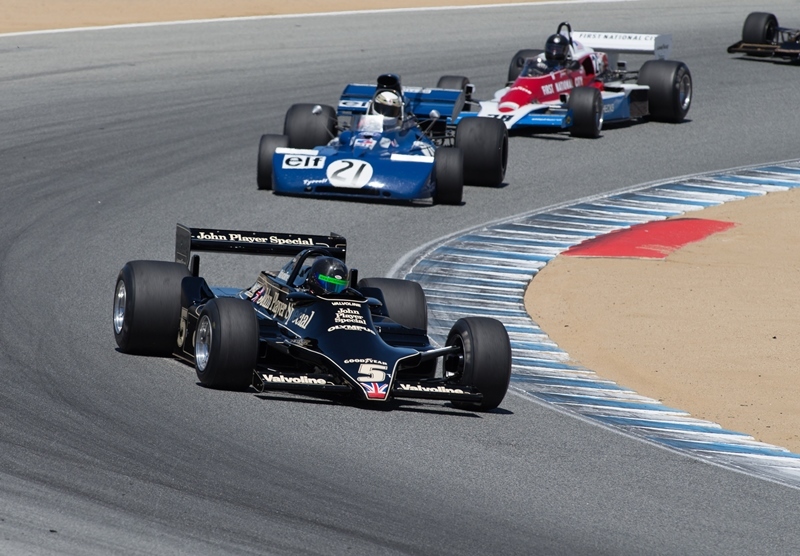 From pre-war to the ‘80s, the overload of sights and sounds at the raceway Aug. 18-21 will provide a sensory experience unique to the renowned Monterey Classic Car Week. Forty eight cars will be running in Group 1A that is comprised of pre-1951 race cars. The oldest in the group is a pair of 1911 Nationals to the “newest” car in the group, a 1950 Talbot Type 26. When owner/driver Peter Mullin straps into the 1950 Talbot Type 26, he will experience a cutting-edge chassis and a powerful engine that was designed to compete in a brand new Grand Prix class – Formula One. With rules that stipulated either a supercharged engine displacing 1.5 liters or un-supercharged engines displacing up to 4.5 liters, Anthony Lago mated a powerful 4.5-liter inline six cylinder to a new chassis that Autocar magazine touted as the “fastest production chassis in the world.” The result was a small, aerodynamic Grand Prix car capable of 166 mph that helped elevate the prestige of French Formula One racing around the world. Another entry in Group 1A is one of four 1932 Alfa Romeo Monzas built to compete in the demanding Mille Miglia. According to caretaker and driver Peter Giddings, the Alfa factory apparently entered three works cars in the 1932 Mille Miglia. These were driven by Tazio Nuvolari and Giovanni Battista Guidotti, Giuseppe Campari and Carlo Sozzi, and Baconin Borzacchini and Amedeo Bignami. A fourth car was entered by Rudolf Caracciola and Pietro Bonini with works assistance. In addition, Scuderia Ferrari entered five 8C 2300 cars and three 6C 1750 Alfas. Alfa Romeos took 11 of the first 12 positions in the race, with the works car of Borzacchini and Bignami winning. At 180 horsepower and weighing 1,984 pounds, this 1932 Alfa Romeo Monza reached a top speed of 140 mph. Racing through Rolex Moments in Time brings fans to Group 7B and the grid of high-revving historic Formula One cars. One such entry is Chris Locke’s 1976 Lotus 77 designed by Colin Chapman and driven by Mario Andretti. Bearing the now famous John Player Special black livery, this Lotus 77/3 was powered by a Ford-Cosworth DFV 2993cc V8 engine and saw a busy 1976 season. Experimentation with side pod design and skirts on the Lotus 77 that season greatly contributed to the development of ground effects in the Lotus 78 the following year. More recently, Locke’s car was used in the filming of Iron Man 2 (2010) and Rush (2013). The Rolex Monterey Motorsports Reunion is a rolling museum that revs to life in 15 race groups throughout the four full days. This year marks a very special occasion: the 100th anniversary of BMW. There are more than 60 BMW race cars entered in the races and BMW North America is presenting its Living Legends Garage that tells the magnificent story of this Bavarian company. Rolex is an avid supporter of the internationally acclaimed Monterey Classic Car Week and has been title sponsor of the Rolex Monterey Motorsports Reunion since it was renamed in 2010. Every year a driver from each group is selected for their overall excellence in the race and receives a Rolex Award of Excellence. The event’s top honor of a specially engraved 18-karat yellow gold and stainless steel Oyster Perpetual Cosmograph Daytona is awarded to the driver who excels in the Spirit of the Weekend. Rolex’s involvement with motorsports runs deep, having been associated with the famed Goodwood Revival since 2004 and, most recently, as a Global Partner and Official Timepiece of Formula 1. For more information on the Rolex Monterey Motorsports Reunion, entry list, fan activities and how to purchase advance tickets, click HERE. Copyright © 2016 WeatherTech Raceway Laguna Seca, All rights reserved.